Band Together – Alliance City Combat Has Arrived for Beta Server! 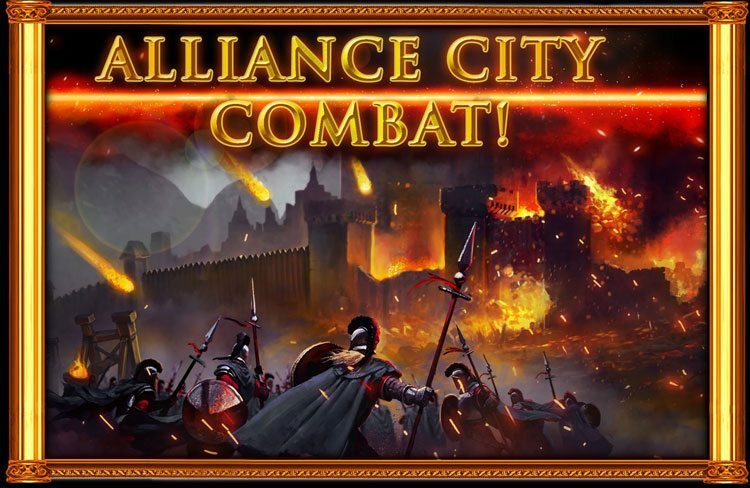 Prepare to dominate together – Alliance City Combat has arrived for Beta Server! • Royal Prison – keep Heroes captured during Alliance City Combat in this building and gain massive boosts for your Alliance. • Stockpile – protect a portion of your Alliance City’s valuable Resources from perishing in the fighting. • Sentinel Tower – make certain your Alliance is informed and ready for looming attacks. • Alliance City Traps – with a wide variety of Traps at your disposal and no limit on how many you can produce, prepare your Alliance City for future challenges. • More Siege Troop Types – lay siege to foes’ Walls and wipe out their Traps with a broad range of Siege Troops. • Additional Building Levels – the benefits you can access for yourself will translate into enormous returns for your Alliance. Watch for more fast-approaching innovations to further bolster your Alliance’s prowess. Besides your Inner Walls and the extensive array of Traps you can fortify them with, you will have access to a secondary line of defense outside your Alliance City. This forthcoming Outer Wall holds Turrets, which will act as the first obstacle invaders will have to face when you are forming an Alliance City Rally. Enemies will only face your Outer Wall if you are currently forming an Alliance City Rally – otherwise the invading army will go straight to attacking your Inner Wall. Unlike Inner Wall Traps, these Turrets will have a cap on how many you can make. Enhance them further with Cannonballs to add even more firepower. They will go a long way towards weakening any attackers, but even if your enemies break through these Walls, they will still have to face the wrath of your Inner Walls. The War Council is located inside your Outer Walls, in your Alliance City’s rural area. It will act as a super Rally Point where your Allies can gather their forces before charging against your foes. This important addition will enable you to organize gigantic Rallies against certain adversaries – much larger than any Rallies possible to date. When your Alliance City Rally is being formed, your Outer Wall defenses help protect it from attack. If these defenses fall to an invading force, then the Troops and Monsters forming your Rally will be killed. This will also cause a temporary cooldown preventing you from building more Turrets or forming another Alliance City Rally. No longer are Monsters solely a challenge for Heroes to test their skills on. Soon, you will be able to utilize their power to augment that of your Alliance and rack up tremendous boosts by selecting deadly Monsters to defend your Alliance City. Bring the full force of your Alliance to bear upon your foes! In addition to the far vaster Rallies available to you through your War Council, you will be able to select Monsters to lead your armies into battle. This fearsome combat will require all the strength you’ve got, so make sure your Alliance is not caught off-guard. As always, this feature as well as the new Core Set may not be finalized and are subject to change. Your feedback is essential towards ensuring potential content is fun for our playerbase! Watch our blog for more exciting updates. AC shields were released. Currently you can only use it to shield an ally. They come in 5-minute, 15-minute, 30-minute, and 45-minute varieties. Also, these ONLY shield against an AC rally. They do not protect against regular rallies or solos. I should clarify: AC shields were released in Beta. Beta is still alive and running. Its clear that all releases don’t get tested in beta like they used to with many releases going directly to the live game. However some releases get let go into Beta still like the AC war ect. But can confirm its still running. Wong about them not being able to just shut the game down! I have played their games in the past and that’s exactly what they did. Well or so tell me they now just leave because they are becoming vulnerable… like everyone else too!? Any sight of an AC shield? Also, what are the beta rally times from an AC? No AC Shield, Rally time is 20 minutes to march outside of wonder forest and 5 minutes if target is inside wonder forest. Thanks. Maybe I add 180billion of troop power and become a AC rally trap. Did the turn on AC trading as well? Then at least 20 min rally gives you time to play shell game with AC resources above protection limit, shifting to allied alliances.